We are pleased to announce the recent publication of our study of genetic diversity among archaeological and contemporary gray and harbor seals from the Northwest Atlantic. In our paper, we describe finding greater genetic diversity in both seal populations prior to the bounties of the early and mid-1900s. We further present evidence that is consistent with the potential loss of a historical Maine subpopulation of gray seals. These findings are significant to the discussion of how to manage gray and harbor seals today as their populations recover along parts of Maine, Massachusetts, and the Canadian Maritimes. The co-authors on this paper include undergraduate Sarah Vincze, graduate student Sky Heller, and professor Mike Kinnison from the University of Maine, as well as collaborators from NOAA NEFSC, Canada DFO, Tufts University, and St. Mary’s University. The project was enhanced by the diverse perspectives of geneticists, ecologists, field biologists, and archaeologists. Our paper can be found here, or feel free to contact me directly for more information. Cammen KM, Vincze S, Heller AS, McLeod BA, Wood SA, Bowen WD, Hammill MO, Puryear WB, Runstadler J, Wenzel FW, Kinnison M, Frasier TR (2018) Genetic diversity from bottleneck to recovery in two sympatric pinniped species in the Northwest Atlantic. Conservation Genetics. 19: 555-569. This past month has been a wonderful whirlwind of work-related travel, to and from Canada (twice!) and roundabout Maine. I kicked off the month with a trip to the University of New Brunswick in St. John to give an invited seminar to the Biology Department. The following week, I ferried across the Bay of Fundy to the Society for Marine Mammalogy biennial conference held this year in Halifax. Finally, earlier this week I gave a seminar at Maine Maritime Academy. These varied opportunities provided a great avenue to share our research with diverse audiences – from students to faculty, and from stakeholders to managers – in diverse formats – from a 4 minute speed-talk to 1-hr seminars. I was particularly excited to speak about cross-border marine mammal issues in both Canada and the US, and I enjoyed meeting many new people as well as catching up with old friends and colleagues. Thank you to Scott Pavey, Jessica Muhlin, and SMM for hosting my visits! 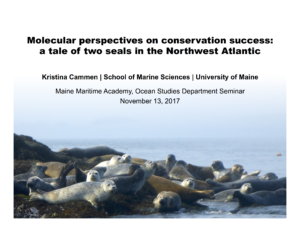 Cammen KM (2017) Molecular perspectives on conservation success: a tale of two seals in the Northwest Atlantic. Maine Maritime Academy Marine Sciences Seminar Series, Castine, ME. Cammen KM, Vincze S, Heller S, McLeod B, Wood S, Bowen WD, Hammill MO, Puryear WB, Runstadler JR, Wenzel F, Kinnison M, Frasier TF (2017) Genetic diversity from pre-bottleneck to recovery in sympatric pinnipeds in the Northwest Atlantic. 22nd Biennial Conference on the Biology of Marine Mammals, Halifax, NS. Cammen KM (2017) Genomic perspectives on protected species recovery: a case of two pinnipeds in the Northwest Atlantic. University of New Brunswick Department of Biological Sciences Seminar Series, St. John, NB.